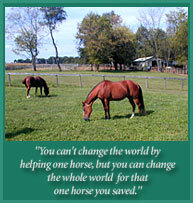 Katie was a 19 year old mare who was purchased by a donor who found her starving in a barn. Katie was brought to Mylestone to be rehabilitated. We soon learned she was older than orginally thought and she had a very bad case of lice. 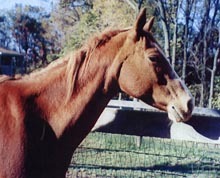 She was the only horse that we have rescued that whinnied for water and was thankful for fresh water. She loved people and food. She had gained about 80 lbs in the past two months we had her, but it would take until the following spring before we knew what she would be like to be ridden, though she does appear to be sound. At that time, she still had 100+ pounds to gain. It wasn't too much later that Nancy fell in love with Katie and was interested in adoption. Katie went out on trial, and the rest is history! 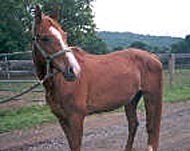 2004 saw a once deprived mare find the home of a lifetime.